The compostela is the ecclesiastical document that certifies that we have made the Camino de Santiago completing at least the last 100 kilometers of any of the Jacobean routes. In Vivecamino one of the most common questions that we receceive is about this document. The Compostela is a document, issued by the ecclesiastical authorities, certifying the completion of at least 100 kilometres covered on foot or on horseback (200km if done by bike) of the Camino of Santiago. The Compostela is issued to all those pilgrims who have had the Credential stamped and thus, have demonstrated their passage along the Camino, on a journey undertaken for religious or spiritual reason – even for self searching purposes – passing through the various enclaves of one of the many pilgrimage routes (all of which are considered as valid). 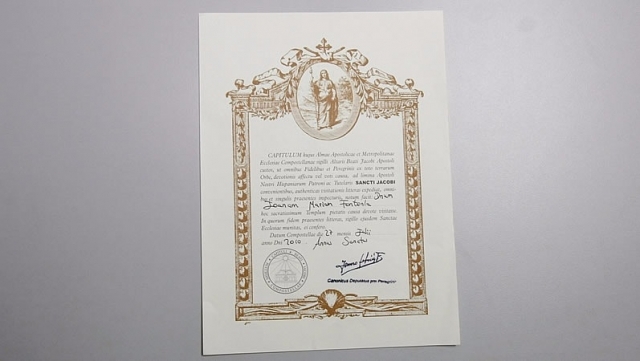 Those who have completed the Camino for other reasons (leisure, sports etc…) can apply to receive another certificate upon reaching Santiago, known as the Pilgrim’s Certificate. In the initial stages, when pilgrimages to the tomb of St. James began to become popular and as a consequence institutionalized, the need to prove having completed the Camino arose. The Compostela as it is known today preceded the original scallop shell insignia which, being easily falsifiable, was replaced by the so-called letters of proof, the current source of official certification. In the XVI century, the Catholic Monarchs constructed the Royal Hospital Foundation, which allowed for Pilgrims, with the Compostela to stay, free of charge for three days staying in the building now occupied by the iconic Hostal de los Reyes Católicos. The foundation was dedicated to providing healthcare to the walkers who came to Compostela, the hospital became the most important in Galicia and eventually the headquarters for the Medical School of Santiago. The building reopened in 1954 as a Parador of tourism, a place, true to the tradition that marks its history, which even now continues to provide free meals, including breakfast, lunch and dinner to the first ten day pilgrims of each day who can identify themselves with the Compostela. Over the years, the Camino of Santiago has become increasingly popular. Tides of pilgrims began to arrive from all corners of the world and with this fervour, fraud and misrepresentation also multiplied and created a fear within the Church that Walkers, instead of considering the Camino to be a sacrifice for forgiveness of their sins would see it as a fun adventure, leaving aside all spiritual motivations. For this reason the Archbishopric of Santiago decided to establish certain requirements for achieving Compostela. Limiting the granting of the certificate only to those pilgrims who came to the tomb of the Apostle for religious reasons, following the routes on foot, by bicycle or on horseback and not granting it to those who had failed to complete the last 100 kilometres, if done on foot or horseback and, if by bike, the last 200km. Both walkers and cyclists have expressed doubts regarding the exact point at which they become eligible to receive the Compostela. The Pilgrim’s office has clarified that, for those going on foot the minimum distance required to obtain the certificate, in the case of the French Way, would be from Sarria or Barbadelo, for the English Way, from Ferrol or Neda, in the case of the Northern Way, from Vilalba or Baamonde, for the Primitive way, from Lugo, and, on the silver route, from Ourense. In addition, those walkers who do the Camino of Finisterre – Muxia and, cover the first stage of the route that connects the two costal locations to then complete the remaining stages to Santiago are also entitled to the Compostela. In this way they would also cover the 100 kilometres necessary. For cyclists doing the French Camino the minimum needed to obtain the certificate (200 kilometres) involves starting in Ponferrada, for those doing the Portuguese Camino, Póvoa de Varzim, for the Northern Route, Tapia de Casariego, for those reaching Santiago on the Primitivo way, Grandes de Salime and, for those doing the silver route, A Gudiña (it is the only case from which cyclists can start in Galicia). The text which includes the Compostela, an illustrated document with characteristic features such as its oak leaf border and scallop shells in which is the Latin name of the pilgrim is written, reads as follows: ” The Chapter of this Holy Apostolic Metropolitan Cathedral of Compostela, custodian of the seal of the altar of St. James the Apostles altar, to all faithful and pilgrims who come from all over the world as an act of devotion, under vow or promise to the Apostles Tomb, our Patron and Protector of Spain, witness in the sight of all who read this document that:(name of the pilgrim) has visited devoutly this sacred temple in a religious sense (pietatis causa). In faith I hand over this document endorsed with the seal of this sacred Church.” The certificate is then signed by the Chapter Secretary of the Church of Compostela. Once the pilgrim arrives in Santiago they can collect the Compostela near to Obradoiro square, in the Pilgrim Office, located in Carretas, 33 (981568846). Any person, including a minor, can collect this document provided that they are accompanied by a parent or in a group and have the ability to understand spiritual or religious nature of the Way. In the case, according to the Pilgrim Office, of not being “sufficiently mature” they are granted a special certificate attesting their names that they have completed the steps of their chosen route. To certify the pilgrimage of infants or very young children normally their names are included on the Compostela of their parents or, the adult who accompanied them. The opening hours of the Pilgrim Office are, in Easter week and from the 1st of April until the 31st of October, Monday to Sunday from 8.00 to 21.00. In winter (from November the 1st to 31st of October) it opens every day from 10.00 to 19.00. The office is closed on December 25th and January 1st. Hikers arriving on those days to Santiago can receive the Compostela in the sacristy of the Cathedral. For years, many pilgrims did not end their long journey in Santiago but rather, continued to Finisterre or Muxia. Given the large number of pilgrims who have demanded a document to credit their covering both routes they created two specific certificates, not officially recognized by the church, and issued instead by the councils. This is the Fisterrana route (created in 1997), for which the certificate must be requested at the hostel of Finisterre, and the route of Muxiana, that can be obtained from the tourist office of this costal resort. In addition, from July 2013 both the tourist office of Padrón (Avenida Compostela, s/n) and, the council hostel of the same town can issue the diploma Traslatio Jacobea (Jacobean boat journey), a document certifying that the pilgrims covered the same route, by sea, as that which carried the remains of the Apostle. The pilgrims should therefore depart from the port of San Vicente de O Grove or Ribeira and, will reach Padrón, the sea journey involves stopping in at least two municipalities in the estuary of Arosa, where they should have their nautical chart stamped to certify completing ​​this route. In Padron they will be given the last stamp and, free of charge, the diploma. Also in Padrón, and from 2010, the credential of this enclave was recovered, which was formally given to pilgrims and has recently been reinstated as Pedronía. With this they earned the sense of the popular saying that ” o que vai a Santiago e non vai a Padrón, ou fai romero ou non” (those that go to Santiago and, not Padron may be pilgrims or not?) This credential is given to all those who go on pilgrimage from Santiago to Padron and, to those who travel from any village of the estuary of Arosa to the capital of Sar or from any distant town of Padron situated at least 18 kilometres away. Pilgrims should also take the opportunity to visit Jacobean places in the capital of Sar: the parish church of Santa María de Iria Flavia, the fountain of Carme el Santiaguiño do Monte and Pedrón. The pilgrimage can be done on foot, on horseback, by bicycle or by boat, be it fishing boat or ferry. In the case of the first cases, if possible, they should reach the river Sar and, in the second case, should dock in A Ponte and continue on foot the stretch to the centre. To obtain the Pedronía, hikers should have the official letter of pilgrimage, which can be downloaded from the website of the county council of Padron (www.concellodepadron.org) and, should have it stamped from their place of departure. On arrival to Padrón the certificate should be handed in to the tourist office, the pilgrim hostel or to the council office.